It has got to that time of the year where the mower is used on a weekly basis. We leave the cuttings to rot down (with just over 2 acres of grass to cut, we don’t really have a choice), so the grass needs to be cut regularly to ensure that the clippings don’t get out of hand. It is amazing what a difference a bit of sun and rain has on the grass! Yesterday we had a minor incident as an old climbing rope (used for attaching our dog to a tree!) was left in the grass. It didn’t take long for it to wrap itself around the blades of the mower deck and bring proceedings to a swift halt. Fortunately, the dog wasn’t still attached to it! It didn’t take too long to sort out this morning, but it meant taking the mower deck off the Z425 to cut the old rope away. While I was at it, I thought I just as well give the underside of the deck a good clean as well as lubricating the spindles. The problem with grass cuttings is that they are very alkaline and attack the paint and metal of the mower deck. Although the underside gets a new coat of yellow Hammerite every year, it doesn’t do any harm to give it a bit of a clean every now and then. This is what happens when someone leaves an old climbing rope in the grass. 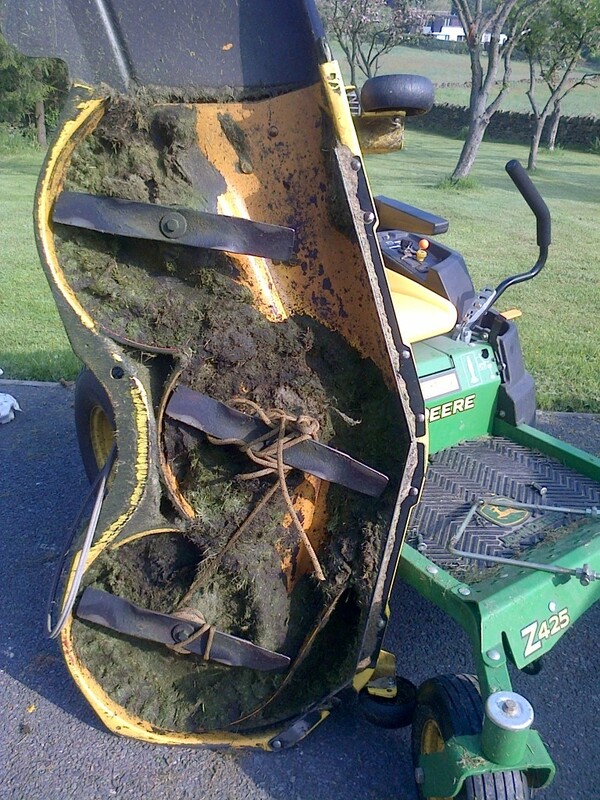 The mower definitely wasn’t happy! Fortunately, there was no real damage done and it only took a few minutes to cut away the old rope. It actually took longer to get the mowing deck off the mower! 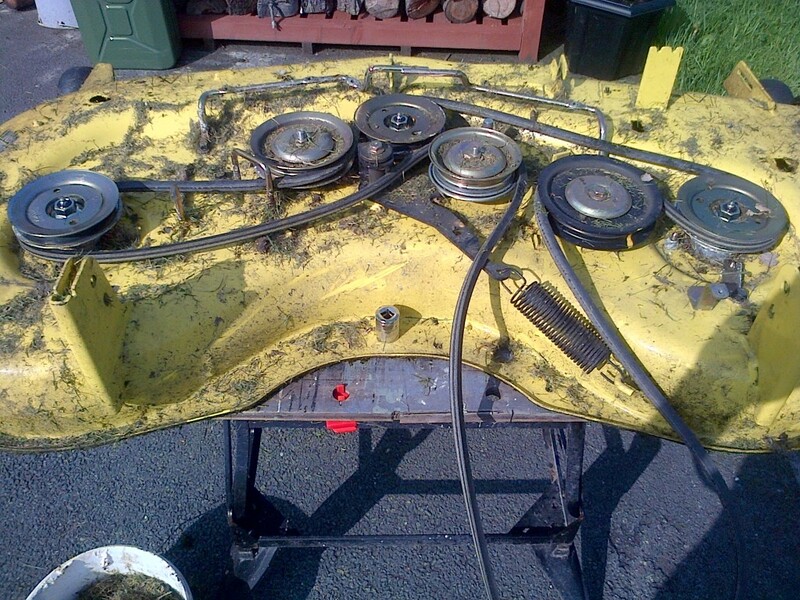 I took the opportunity to clean out the grass and hose down the underside of the mower deck. 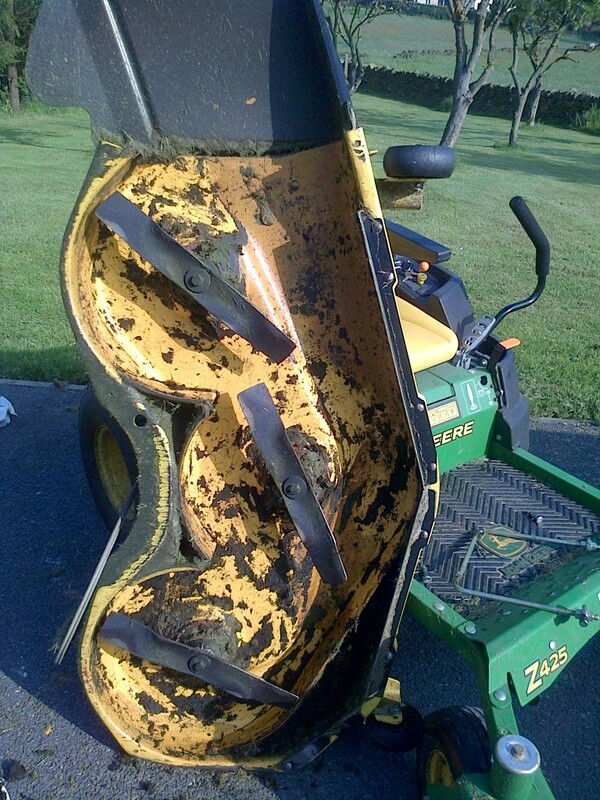 I have never had to remove the belt completely from the mower deck. I thought it might be a good idea to take a quick photo of the belt just in case it ever snaps and needs to be replaced.